"Game Changing Brazilian Style Soccer Trng since 2002"
AGES: 8-10 @ 5:00 - 6:10, 11-13 @ 6:15 - 7:30. TUES AND THURS, CO-ED. LOCATION: GYM OF ST. ANN CATHOLIC - 100 Daniel St, Gulf Breeze, FL 32563. 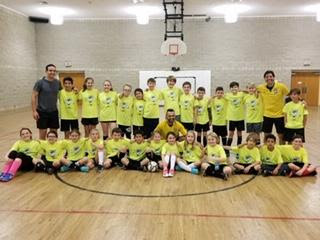 FEE: $175 FEE INCLUDES 7.5 HRS OF TOP QUALITY FUTSAL TRNG BY FORMER BRAZIL PRO, T-SHIRT, TOURNAMENT 7/11, PIZZA PARTY, PRIZES, LOCAL BOYZ HAWAIIAN SHAVED ICE, AND BONUS "SAND SOCCER DAY" 7/2 P'COLA BCH! (JULY 4 SESSION WILL BE ON JULY 5). FOCUS: PREMIER PLAYER DEVELOPMENT & SKILLS TRNG IN AN INDOOR SMALL GROUP POSITIVE ATMOSPHERE, GREAT COMPLIMENT TO TEAM PLAY, MAX BALL TOUCHES, CONFIDENCE BUILDING, BALL RETENTION & MASTERY, VARIOUS FOOT SKILLS LEARNED, QUICK DECISION MAKING, SCRIMMAGES....... FOR INCREDIBLE RESULTS AND PROVEN CARRYOVER INTO GAMES. SPACE LIMITED!